Would you like to learn how to crochet? I have written this article to give crochet beginners basic instructions on how to crochet and an easy reference for crochet terms, basic crochet stitches and easy diagrams. 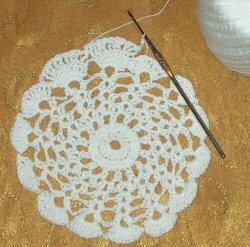 When you crochet, you can create beautiful home décor such as afghans, doilies, table runners, table cloths, window treatments, etc. If you are a fashionista, you can crochet sweaters, vests, purses, totes, and jewelry that are truly one of a kind. 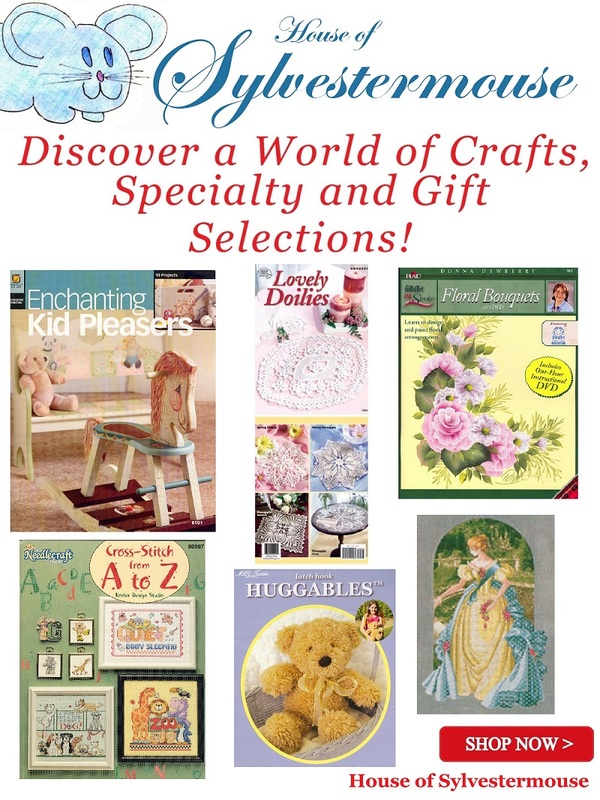 Why not make gifts like bookmarks, Christmas tree decorations, coasters, pot holders, or crochet lace trimmed frames. And for the little ones in your life, you can make crocheted animals or doll clothes. Your gorgeous handmade items become priceless heirloom treasures that can be passed down for many generations. So, lets get started! You will need a crochet hook and yarn. Hooks come in different sizes. 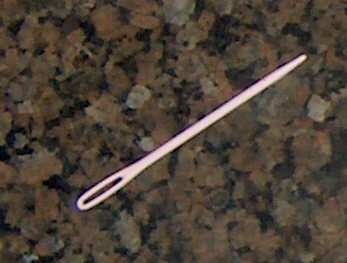 The size of the hook determines the size of your stitch. The thickness of most hooks is indicated by both letter and number. The larger the number, the larger the size. Steel hooks are the exception. They are measured on a reverse scale. A 14 is the smallest size and the 00 is the largest. When selecting the size of a hook for your project, a good rule of thumb; the thicker your yarn, the larger your hook. You may also want a pattern. While a lot of experienced crocheters work without a pattern, as a beginner, you will probably want a pattern. A pattern will take the “guesswork” out of crocheting and a pattern will tell you the size hook and the weight of the yarn recommended for your project. When selecting a pattern, look for one that is marked “Easy” or “Beginner.” Some patterns are marked with stars. You would want to select a 1 star pattern. If you aren’t sure what your first crochet project will be, I recommend purchasing a set of crochet hooks. That way you have whatever size hook you need on hand to start whatever pattern you select. 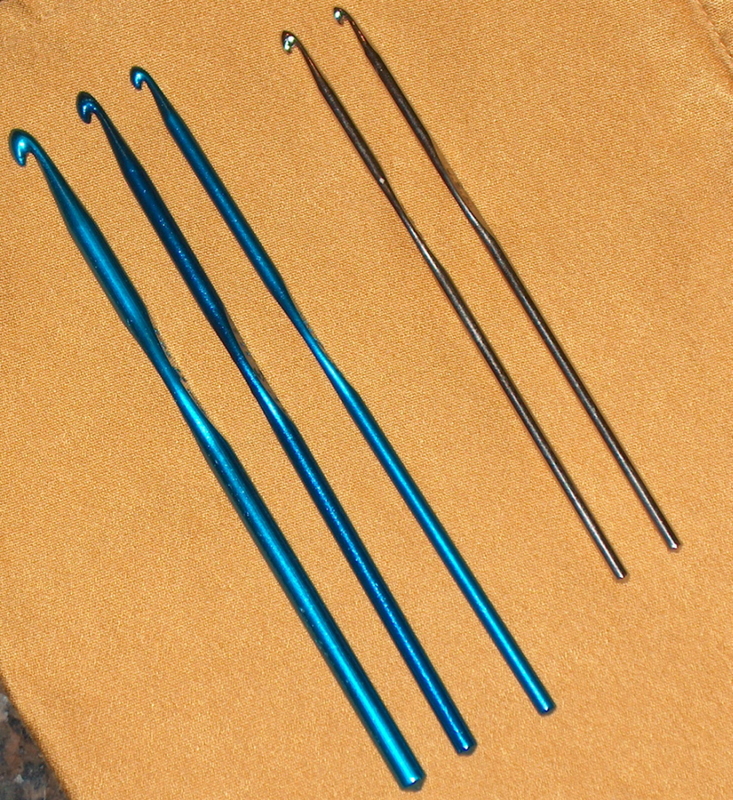 Also, a set of crochet hooks is often as inexpensive as a single hook. A detailed, step-by-step tutorial with instructions on how to crochet an unusual, 2-colour, tile hexagon coaster. Complete with photos at each stage and demonstration videos of key crochet stitches and techniques. 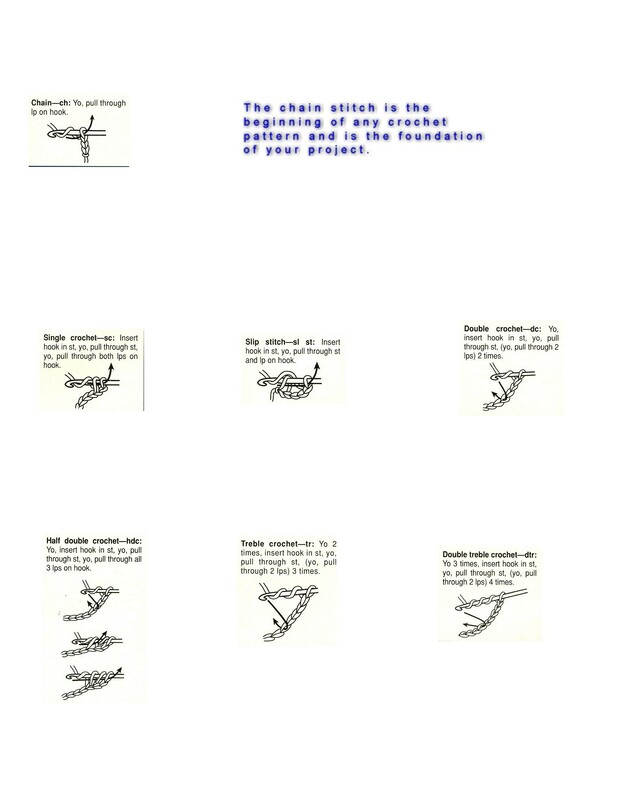 Crochet patterns at a glance can look intimidating and confusing. Like so many other things in life, with a simple “glossary”, a crochet pattern can be easily deciphered. Hold it like a pencil, with your thumb and index finger on each side of the flat portion of your hook and your middle finger resting against your thumb. Wrap the ball end of your yarn around your little finger of your left hand. Take it under the fourth and third fingers, then over the top of your index finger. This allows the yarn to slip easily across your fingers and to the hook. To begin crocheting, you start with a simple “chain” of stitches. To start a chain, make a slip knot about 6″ from the end of the yarn and insert the crochet hook from right to left. Position your fingers and hands as illustrated below. 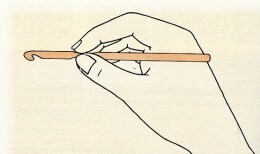 Draw the yarn through the loop, thus forming a new loop on the hook. Keep this loop loose enough so the next chain can be drawn through it easily. Why not use your first sampler as a bookmark to mark all of your future crochet projects! Since this is your first sampler, I will try to be very specific and spell out the words following each abbreviation. In a published pattern, you would only see the abbreviations. You are now ready to work the first row of single crochet. sk (Skip) the last chain made and insert the hook into the next chain, hook the yarn and draw up a loop. There are now 2 loops on the hook. Catch the yarn over the hook again and draw the yarn through both loops on the hook. A sc (single crochet) is completed and 1 loop remains on the hook. rep (repeat) these steps to draw up a loop and make a sc (single crochet) in each remaining chain of the foundation chain. Make one ch (chain stitch) and turn work. 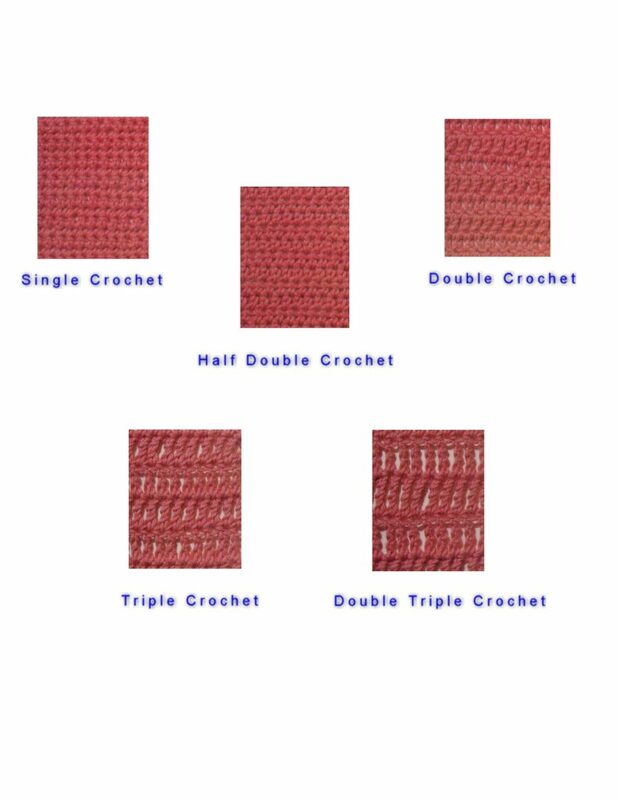 *Work a sc (single crochet) in each single crochet of previous row, inserting hook under the two top threads of each sc to draw up yarn loop for new stitch. 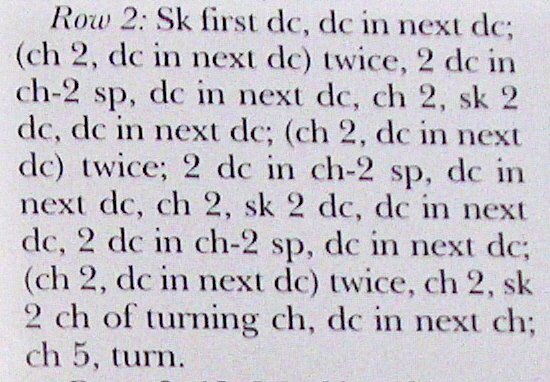 At the end of the row, ch (chain) 1 and turn. Repeat from * until you have desired width. To fasten off on last row of work, cut yarn and draw yarn end through last loop. Tighten to keep yarn from unraveling. To hide the yarn “tails”, thread the end of the yarn into a tapestry or yarn needle and weave it into the back of your work. 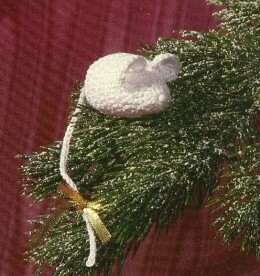 This Crochet Mouse Pattern can be found in “Quick Crochet Gifts” by Sandra Peach. This booklet was published in 1988 and it is very hard to find. I am placing the current Amazon link for this booklet directly below. If it should be sold out at the time you wish to purchase it, please contact me if you really want this book and I will search for it again. 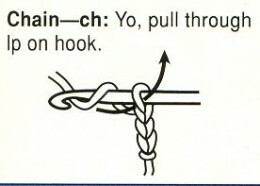 This YouTube video shows you how to properly hold your hook, yarn and how to do the basic chain. To hide the yarn “tails”, thread the end of the yarn into a tapestry or yarn needle and weave it into the back of your work. This article only covers the very basic instructions to get started crocheting. There have been many books published on “how to crochet.” I have found that you can probably easily learn to crochet by watching YouTube Videos. I said earlier, there are many books on how to crochet available. This Reader’s Digest Needlework Guide Book is by far the best I have ever found. In addition to crochet, several other needlework instructions with great photos are included in this book. No needlework library is complete without this excellent book. 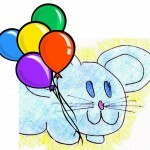 This tutorial was originally published by me in 2009 on a different site that no longer exists.